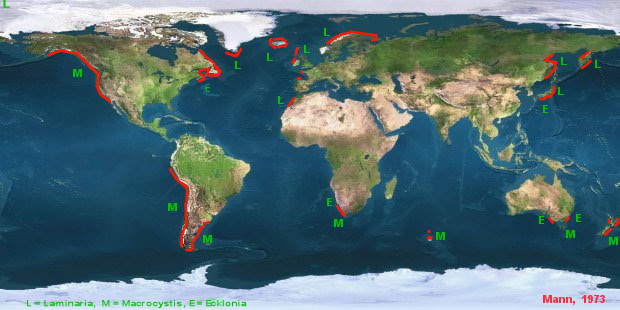 Kelp forests and beds are limited to latitudes between subpolar regions and places where seawater can become warmer then 20oC. Extension of kelp forests into the subtropics is associated with upwelling of cold water such as the Californian and Peru currents. As they thrive at the "other side" of the 20oC isotherm coral reefs and kelp forests are mutual exclusive. 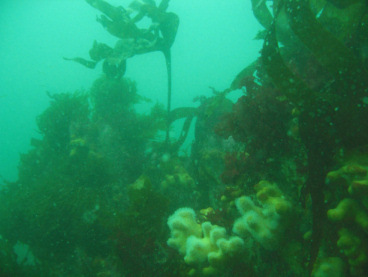 Kelp beds and forests are dependent of a hard surface to attach and enough light to grow. In clear water kelp beds and forests extend out of the shore to depths of 20 to 30 meters. Kelp are large seaweeds belonging to the brown algae. They are classified in the order of Laminariales which consists of over a hundred of species. But more important in terms of diversity is the fact that they form a three-dimensional habitat that attracts numerous invertebrates and fish. If the plants form a floating surface canopy we speak of kelp forests (Macrocystis species), if they don't we spreak of kelp beds (Laminaria and Ecklonia species). Kelp has a impressive high productivity. And, as there aren't many species that can feed on kelp plants they can form dense growths. Sea urchins are the most important grazers on kelps. In high densities they are capable of completely eliminating kelps. On the other hand, when urchin mortality is high, kelps will cover the bottom quickly. 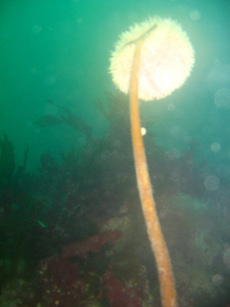 In many places the waves obstruct the sea urchins to climb the kelp plants. This helps survival of kelp, at a certain size they won't be grazed any more. In such circumstances urchins will have to feed on broken fragments or on young plants. Sea urchins on their turn are eaten by crabs and sea otters.